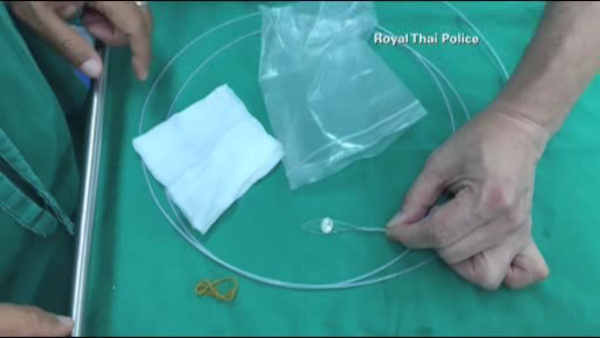 BANGKOK -- The good news for the Chinese visitor to Bangkok was that a doctor had successfully removed a foreign object from her large intestine that could have damaged her digestive system. The bad news: It was a 10 million baht ($278,000) diamond the woman was accused of stealing from a jewelry fair, adding a piece of rock-hard evidence to the case against her. Police Col. Mana Tienmaungpak said Sunday that authorities got to the bottom of the theft when a doctor wielding a colonoscope and the medical equivalent of pliers pulled the 6-carat gemstone from the large intestine of the woman alleged to have filched it, after nature and laxatives failed to get it out. The woman, identified as 39-year-old Jiang Xulian, and a Chinese man were arrested Thursday night at Bangkok's Suvarnabhumi Airport on their way out of Thailand on the basis of surveillance video from the fair just outside Bangkok, where earlier that day the duo allegedly switched a fake stone for the real one after asking to inspect it. The dealer at the booth selling the diamond also identified the two. The suspects initially denied involvement, but X-rays showed a diamond-like object in the woman's intestine, and police said she then confessed. Mana, the chief investigator for the case, said the woman agreed to Sunday's delicate operation after being told that the gemstone risked injuring her. The diamond's owner identified the stone after it was removed. In 2012, police in South Africa arrested a 25-year-old man who they said swallowed 220 polished diamonds in an attempt to smuggle them out of the country. The diamonds were estimated to be worth about $2.3 million, and were discovered by a body scan as the man was waiting to go through security at the international airport near Johannesburg prior to taking a flight to Dubai.